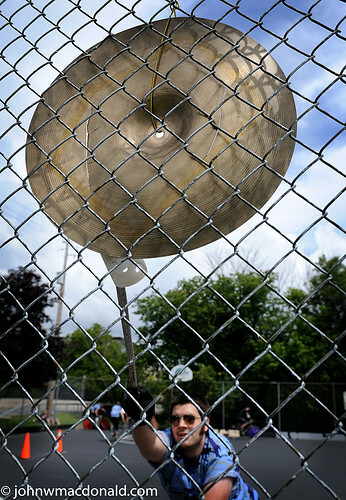 Bike Polo - Cymbal, originally uploaded by johnwmacdonald. One of the rules in bike polo is when a player foul's out (i.e. steps off the pedal onto the ground during play) they must ride to one side of the hard court and bang a post with their mallet. Well, anyone just bang a post...banging a cymbal is just that much classier. 2008 North Side Bike Polo Invitational in Ottawa's Little Italy. Go for the polo stay for the sandwiches at DiRienzo's.